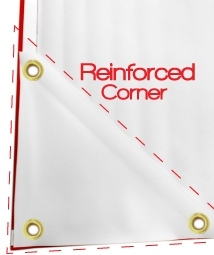 Banners.com: What are Reinforced Corners? The standard finishing option for vinyl banners is hems and grommets, but we also have reinforced corners. We recommend adding reinforced corners on banners over 32 square feet that will be used outdoors for added durability. Reinforced corners are made of 13 oz vinyl banner material that is reinforced with 1 3/16" PVC coated webbing to increase the strength. The material is cut into a triangle and added to each of the corners of the banner on the backside. The corners provide extra strength for the banner. Three grommets are used to hold the reinforced corners in place. We also add grommets every 2-4 feet around the banner perimeter to help you hang the banner. We recommend keeping all important text and images at least 2-3 inches away from the edge of the banner to avoid having grommets go through your information. You can not have pole pockets with reinforced corners. Click here for additional vinyl banner finishing options.